What it’s about: Kerewin Holmes is a reclusive artist secluded in her stony tower in a small town in New Zealand. Joseph Gillayley is a Maori factory worker and a widow. Simon is his foster son, a mute and feral child washed ashore in a shipwreck. The three find one another when Simon breaks in to Kerewin’s house and the emotionally detached Kerewin soon finds herself drawn into the mystery of Simon’s past and his struggle to be understood and accepted. Joe seems to be a caring foster father, but his rearing of Simon is anything but orthodox. He shares his smokes and drinks with the seven-year-old and seems to hardly care if the boy shows up for school or runs to Kerewin’s for the day. Yet he cares for the boy tenderly as he wakes in terror from nightmares of his past life. To Joe and Simon, Kerewin is a savior. She is someone who will accept them and perhaps understand their life as outsiders. But as their friendship grows, Kerewin will discover a darkness in Joe and Simon. The winner of the Man Booker Prize, this book is beautiful, sad, and a bit challenging. The style is different from anything I’ve ever read. The author includes snippets of song and poetry along with passages in the Maori native tongue, similar to the way The Brief and Wondrous Life of Oscar Wao incorporates Spanish text. The narrative also jumps from first to third person, shifting from the perspectives of each of the three main characters and back to an omniscient narrative. There is also a lot of dream imagery which gives the text a stream-of-conscious flow and a surreal feeling. This style was completely foreign to me, making it a bit difficult to become completely engrossed, but it also made the book seem more exotic. It’s appropriate given the emphasis on the Maori people and the underlying message about the spirit of traditional New Zealand. The story has a lot of dark and light and I’ve kept back the most important revelation in the book for those who may choose to read and still be surprised. 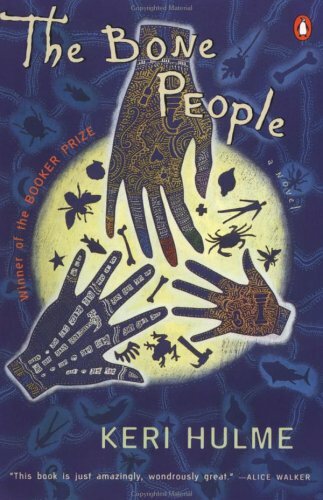 A Note About How We (As A People) Choose Books: The Bone People is a Barnes and Noble shelf-browsing find for me. In a sea of thousands of crisp paperbacks, its harder than one might imagine to pick one off the shelf, which is why we so often rely on the tables. I am a victim of this marketing ploy as much as anyone else! The shelves seem daunting and endless while the tables are so neat and nicely arranged. And no matter what the adage says, we really do judge a book by its cover. But since I know the books that end of up on those tables are all there because of a massive marketing push, I really try to make an effort to go to the shelves and dig around a bit. I find that smaller independent bookstores are much more conducive to this. Growing up, I used to frequent The Bookmark in my home town of Atlantic Beach, FL. It had a perfect setup and always seemed to cater exactly to my needs. I found some of my favorite books in the sunny shelves and with the help of the knowledgeable Ronna, who still owns the shop. Now that I’ve moved to New York, I’ve been looking for a place with the same neighborhood atmosphere I found at that shop. The Strand has carved out a special place in my heart for its rare books room, half-price hardbacks, and the quirky finds in its sky-high shelves. But it’s too large to be much good for shelf-browsing. I need a smaller place that is mystically in touch with all my favorite genres. I’ve wandered into many a small shop in the city, but I’ve yet to feel that spark with one. New Yorkers, any suggestions? Would I recommend? Maybe. I enjoyed reading this book, but I don’t think I would re-read. I enjoyed the unique style, but also found it challenging. I’d recommend to those who enjoy stylistic and poetic books.